In Defense of Communism: Thanasis Pafilis (KKE): "The capitalist way of development neither wants nor can give a better life to the people"
Thanasis Pafilis (KKE): "The capitalist way of development neither wants nor can give a better life to the people"
The KKE's pre-electoral evaluation that the SYRIZA government will continue towards an even worse way than the previous governments and will bring a third memorandum has been proved, Thanasis Pafilis, member of the Central Committee and Parliamentary representative of KKE pointed out in a TV interview. Talking on "Skai" Television, Pafilis said that the only hope derives from the people who must take the streets and fight for their lives; he called the people to participate in the demonstrations that will be held on October 17th by hundreds of labor unions. When asked about the "left" character of the government, Pafilis mentioned that the people know that "Left and NATO" are not compatible, bringing as an example the offer, by the SYRIZA-ANEL government, of a new military base to NATO at Karpathos island. 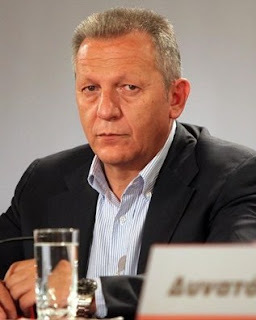 A left party, Thanasis Pafilis said, is not the one which crushes the working people, the self-employed and the poor farmers while it gives new privileges to those who have the power; the capital and the monopoly groups. The solution, Pafilis pointed out, is not New Democracy which poses as the original best manager of the bourgeois power. The KKE MP said that the capitalist way of development has bankrupted, not only in Greece, but in the whole world, because it doesn't want and cannot give a way out to the peoples for a better future. He mentioned that the recovery which may come will not be in the interests of the workers and we must not forget that, historically, Capitalism has overcome his crises only through wars. The solution, Pafilis underlined, lies in the scientifically documented proposal of KKE, through the pass of the power in the hands of the working class which produces the wealth, with a planned economy, for the interests of the people.